My daughter just loves unicorns, so for her 5th birthday we did some unicorn flowers for her party! They looked so festive down the center of the table and are so, so easy to put together! I got the containers from the dollar store and then just cut out the ears, horn and eye lashes from glitter craft paper to make it look like a unicorn. It was a little time consuming, but super easy. I used glue dots to adhere the unicorn ears and horn to a bamboo skewer. For the eye lashes, I just used 1/2 of a medicine cup to make the half moon and just drew out the lashes to cut. 1- It looks the most to me like unicorn fur. 2- It lasts FOREVER (probably 2 weeks). 3- It is cheap – like $4 for this whole arrangement, which to me sounds about right for a 5 year old birthday party. Ha! The total cost of this arrangement was about $5.50 at the most. As you can see, this is definitely something that is easy for beginners, and would be even a fun project for you to do with a little girl in your life! I adhered the lashes prior to putting the flowers together, then just bunched the alstroremeria into a dome shape and added the ears and horn as a finishing touch! 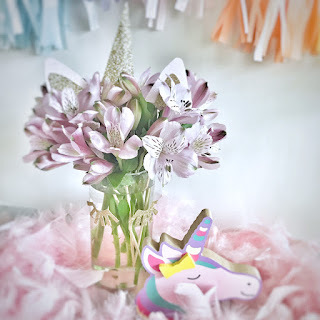 Get other floral design tips here or check out other party ideas here!